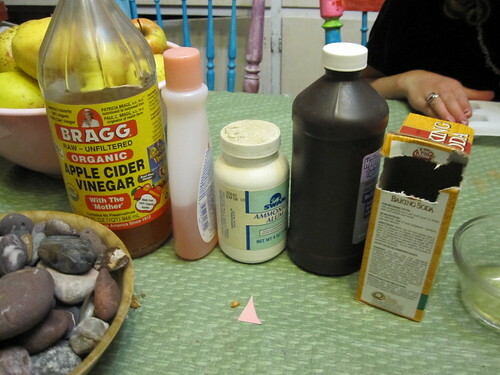 Okay, as promised, here are instructions for the purple cabbage pH experiment. Purple also happens to be the theme this week at Unplug Your Kids, so it worked perfectly for us. 1. 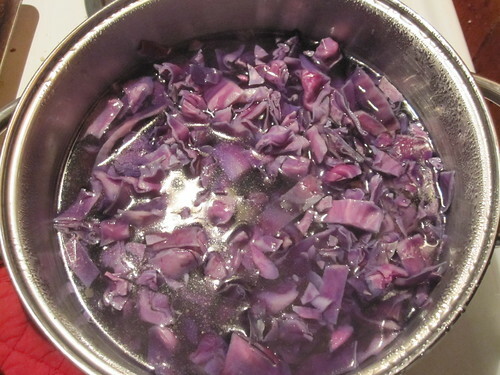 Chop about 2 cups of purple cabbage and cover with boiling water. Put a lid on it and steep for about 10 minutes. 2. Strain out the liquid and reserve. It should be a deep blue-purple color, though it may be affected somewhat by your water. 3. 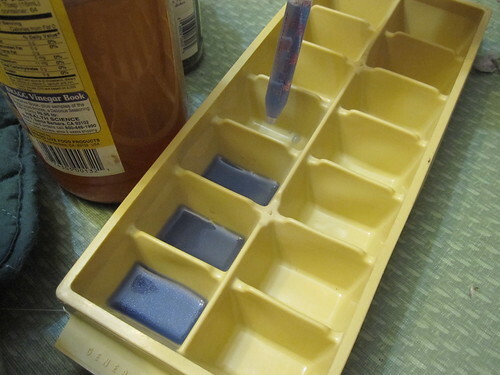 Put a little cabbage water in each compartment of a light colored ice cube tray or similar container with many sections. For little kids, a muffin tin works well. 4. 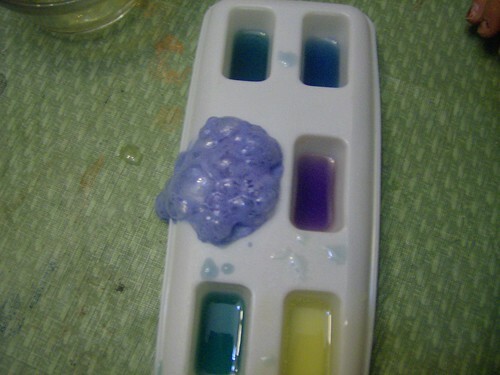 Assemble a variety of substances (preferably white or clear) to test. For younger kids, put just a few in some larger dishes. Older kids can gather lots of test substances and use them directly from the containers. 5. 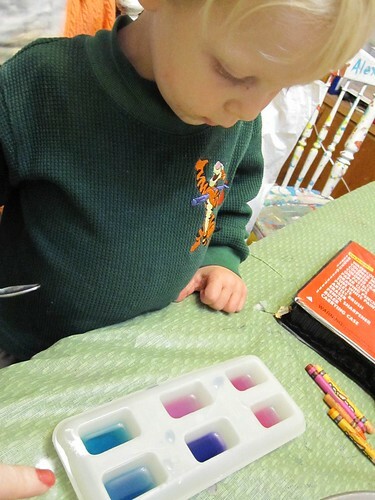 Give each child a small spoon and an eye dropper and explain about the pH (potential of Hydrogen) scale and how pH indicators change color to reflect the pH value of substances (more pink for acidic, more towards green or almost yellow for base, though blue was generally as alkaline as we got). This site gives more background info (though they do a different experiment). 6. Let the kids add various substances and see what happens! Make sure you keep track of which substance was added to which compartment. Check out this range of colors Victoria got from various substances! Some of the best reactions were from the alum, hydrogen peroxide, hot sauce (2 drops and it was hot pink! ), wine, club soda… okay, there were an awful lot of good substances, and even those that didn’t change much taught us something! Next time I’d like to compare rainwater (or melted snow) to tapwater to distilled water, plus see about detergent (which is supposed to be very alkaline). But wait, there’s more! 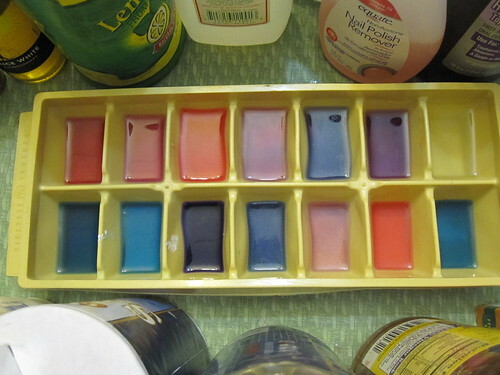 Once you’ve changed the colors of the liquid in each, challenge the kids to change it back! Ask them to think about what they can add to a hot pink to make it blue again, for instance. In a few cases, you end up with a reaction (notably baking soda and vinegar ending up in one compartment). Obviously, don’t put out substances that can react violently together (like bleach and amonia) but I wouldn’t recommend putting those out to begin with. The harshest solution we dealt with was probably the fingernail polish remover, which only Victoria and Anna used. When the little kids were doing it, I only put out very benign materials like baking soda, lemon juice, baking powder and vinegar. Even with just these they can change the colors back and forth and make reactions. On the second day, I gave Alex a muffin tin, cabbage water, bowls of baking soda and vinegar and a spoon and eye dropper and he happily dribbled, stirred and mixed for an hour! We discussed pH the whole time we played — how shampoo is supposed to be pH balanced so it doesn’t sting eyes, how some hydrangeas are pink in acidic soil and blue in alkaline, and so on. 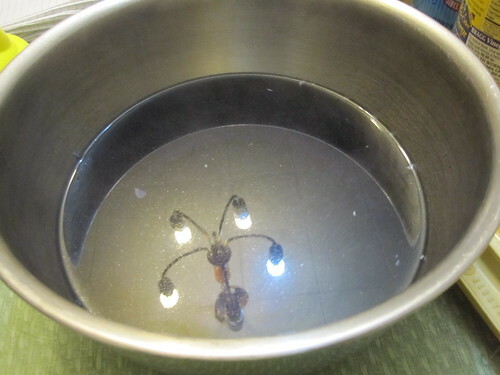 This entry was posted in pictures, science, Unplug Your Kids by Alicia. Bookmark the permalink. That is an amazing experiment! Wow and cool! Oh my goodness that is cool! I am definitely putting that on our list to do soon. .-= Sara´s last blog ..Won’t finish reading – The Great Transformation =-. I eyed the cabbage, with a vague thought of ph experiments, when we were picking up the purple potatoes – but I don’t think we would have done anything this impressive – thanks for the how-to. 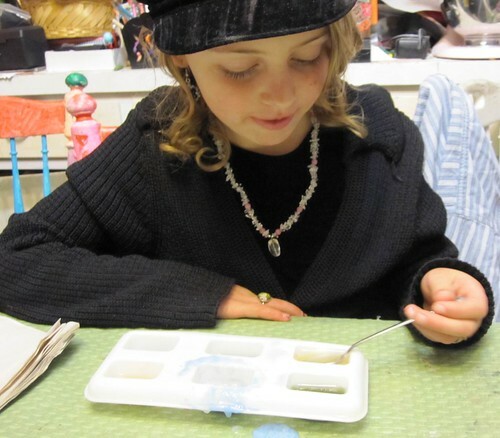 .-= An Almost Unschooling Mom´s last blog ..Cold Porcelain Clay Bear Pendant/Ornaments =-. Aren’t you afraid of getting arrested? I thought teaching chemistry is banned in the US, like in other totalitarian countries like North Korea for example. Or are you perhaps Canadians? I remember this from middle school, although I never got to try it myself. I would definitely try it with milk, cola, and maybe some mashed foods with distilled water. Any chance of getting the kids to eat the leftover cabbage? Just kidding, but I do love red cabbage with a smidge of butter. Makes me hungry just thinking about it T-T.
Haha, I’m at Michigan State University, and we just did this in our chemistry lab! Fun for any age. Although we used more serious chemicals, same concept and same cabbage! Oh my gosh, that is so cool! Definitely bookmarking this for later. .-= tinderbox´s last blog ..FIAR practice week: Day 1. =-. I really liked this project. I enjoyed it aaaaaaaaalllllllllllllllllllllllooooooooooooooooooooottttttttttttt.